The ideal chassis designed with you in mind. Omni Chassis offers approximately 350 different sizes. All parts of the same height are completely inter-changeable. Omni Chassis requires only 10% of the storage space taken up by bulky, pre-assembled chassis. Constructed with individual sides and a flat cover with optional matching bottom. The cover and bottom are interchangeable. Easily reusable. 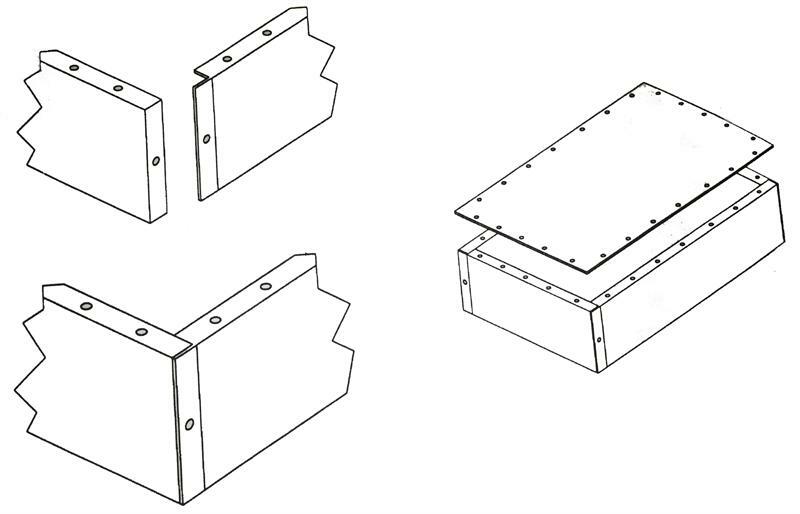 By keeping an assortment of sides on hand, you can make a wide range of chassis configurations. Top cover may be firmly fastened to the sides through the pre-punched mounting holes on the sides and cover. (Self-tapping screws supplied). Held firmly together by screws at flush fitting, interlocking corners. All sides and covers are punched in matching one inch increments. Perfect for the home craftsman, the prototype designer, and for short run needs. All sides are .040 aluminum. Covers to 8inch x 17inch inclusive are .040 aluminum. Covers from 9inch x 9inch to 12inch x 17inch are .050 aluminum. Covers from 13inch x 13inch to 17inch x 17inch are .063 aluminum. 1 or 2 cover/s 3inch wide x 7inch long (C-37). All sides are packed in pairs with mounting screws.